The vernal pool working group was initiated in 2009 to address the growing concern for species in the Northeast that use these intermittent wetlands for breeding. Vernal pools are small, isolated wetlands that dry up periodically. As a result, they are difficult to locate and identify, and are especially vulnerable to filling, draining, and other alteration. Recent changes to Federal wetland protections left most vernal pools unprotected, further exacerbating the potential for amphibian habitat loss. 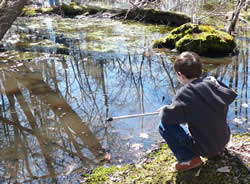 The working group plans to analyze the status and protection of vernal pools by different States in the Northeast region and summarize pool mapping efforts and methods. Through conference symposia, a list-serve, and web-based resource lists, the group also aims to support and connect conservation professionals working on vernal pool conservation. If you are interested in joining the Vernal Pool Working Group, email Stacy McNulty or Mary Beth Kolozsvary.